Law School studying is a new beast in comparison to my previous schooling. I have had to adjust my study habits and increase my study time. I heard that Law School was a place of dueling study groups and people stealing books, etc before coming (think Legally Blond); thank goodness I have not encountered any of that. Studying may be hard but my classmates are all in it to help each other succeed and it is wonderful. I have experimented with solo and group studying and would like to share some of what I have learned and my thoughts on the pros and cons of each. Solo studying is what I use the most. I prefer to study at home and obviously I am usually the only Law Student (the hubby occasionally runs through flashcards with me but that doesn't really count). I have learned that solo studying is good because there is a lack of distractions; the only distractions are the ones you create yourself. You can choose your own music (movie scores for me! ), your own snacks, no one cares how loud you chew your gum, you can spread your stuff out as much as you want.... so many wonderful things. Also, as a very fast reader, I prefer to work alone so that I can keep my own pace and not slow down for others. Research is much easier alone because it is something usually trapped up in your own head- sharing it with others is something I have never been good at until I have the final output of a paper, memo, etc. Studying solo does have some cons. When I become confused on a subject, it would be so much easier to be sitting with my friends to help clarify instead of trying to text them and wait for an answer, etc. Also, studying in a group often helps to keep you on subject; I do not get distracted because I am surrounded by everyone else working hard and that motivates me to get to town on my work as well. I find it easy to go off to do laundry or watch Netflix and there is no one to stop me but myself. Studying solo requires a lot of self-control and self-discipline. Studying in a group helps me to stay on track and stay motivated. It is also great for bouncing questions off each other, understanding a tough subject, discussing the law and gaining a deeper understanding, and so much more. It is also a great way to become really good friends with a few of your fellow law students; nothing brings people together quite like marathon study sessions over Property law! I love utilizing study groups for tough material I am having trouble with. Studying in a group requires compromise: location, environment, noise, etc. Not everyone likes listening to music or smelling your snack. Also, sometimes group studying can grow some resentment if someone completely understands one aspect and the others don't; if that person acts better than them or makes the others feel stupid for not understanding, that study group likely will not work (a very common trait among law students is feeling better than others). To succeed in a study group you have to be willing to help the whole; don't boast when you understand something the others don't, help them to understand it better. A study group lives and dies by the right people. Make sure you choose wisely when choosing your study group and if it is not working, you don't have to stay. Also, choose people who are mature and motivated, they are less likely to draw the group off topic. Personally, I have continued to do the bulk of my work solo (reading, briefing, outlining, research, legal writing). I have begun to utilize study groups for tough subjects and exam prep. I currently am a part of a study group to prepare for our Property midterm exam over Estates and Future Interests. Law school is full of very challenging material and working through things as a group has been super helpful. However, I have experienced one good and one bad study group. The good one is still going and I just slowly stopped showing up to the bad one because it just wasn't helping me at all. 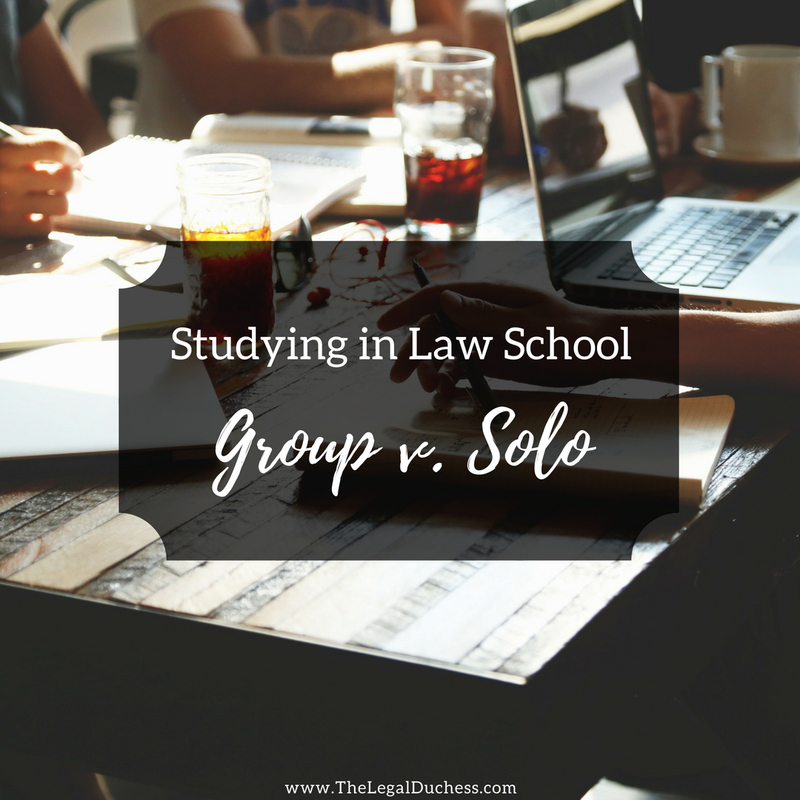 Law School is all about learning and being successful; surround yourself with people who help you achieve that or become best friends with your desk and go solo. Whatever works for you, just study and get it done. Law School is only 3 years thank heavens!